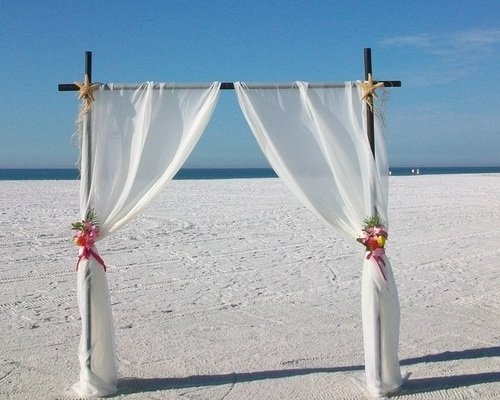 Our Tropic Sand beach wedding ceremony package for our tropical beaches. This package includes our Chocolate bamboo Arch, 2 tropical or Coral floral arrangements & 2 starfish. This SunCoast Florida area beach wedding package is perfectly affordable for small destination weddings, elopement ceremonies and Vow Renewal Celebrations. Inquire for details & pricing on our wedding package options. Our packages do Not include any required beach permits or Florida marriage licenses. See our Beach Wedding Options Page for details.